It's Monday today (I know, I was vile of me to emphasize that), but... it also means we've survived one week of the NBI, hurray! I think almost every sponsor wrote at least one advice post this past week, which made us end up with about enough food to publish a whole book. I first planned to post them here, but when I saw their large amount (28 and counting) I became struck with a sudden strike of laziness. You can always check them out here at the source, though. At first I was a bit worried by the low amount of newbie blogs participating - I know some say that blogging is dead, but surely it isn't that dead?! - but as the week proceeded, more and more checked in, and now I'm having a day's job checking out all these new blogs. I've made a special blogroll with NBI initiates which you can see to the right (scroll down a bit). Be sure to check them out and leave a comment if you have the time - I remember how much that motivated me when I was a newbie myself last year. I know there are a lot of blogs on there, but picking just one to leave a comment behind is already a great thing. And if you cannot choose, I'll help you a bit here. Lyle's Grind: brand newly started and inspired by the NBI, Lyle's Grind certainly doesn't look at all repetitive as the title implies. Lyle writes about all sorts of games and mentions tribbles in a post, so this is a blog I cannot ignore. The Cynic Dialogues: a recently revived blog in which Scree is currently investigating new games on the horizon. I'm enthusiastic about the prospect of another blogger who might get into TESO and for the most part just can't look away because the layout looks so darn nice. Crucible Gaming: no official newbie of the NBI, but a new blog nevertheless that I discovered earlier this week. 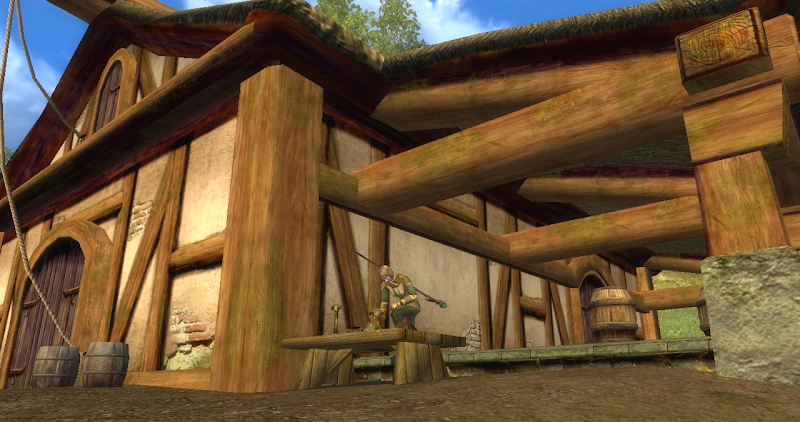 Much to my surprise, Sig writes about LotRO and SWTOR: my favourite subjects! A must-check for everyone interested in these games. That was it, keep blogging, commenting and see you around with the NBI! Blogging isn't really dead, it's just evolving. Twitter is really just microblogging. Tumblr is more suited for pure media than text based. Both have dedicated userbases. Traditional blog creation may be a bit lacking compared to a few years ago, but think about this: any time you go search Google for almost anything, a lot of your top hits that ARE NOT web-stores are blogs or non-mainstream news sites based on a blogging platform. My relationship with the NBI is a weird one. I've been blogging for a long time and am able to offer my experience up as a mentor, however my gaming blog is brandspankinnew and could benefit from the NBI the same way a new blogger might. Thanks for the linkage! Also, thanks for enabling NAME/URL in comments! Now I don't have to fuss with Google and Wordpress telling me I am in the wrong account all the time! And the link is deserved, we totally can use some more SWTOR blogs out there! I fear your joy about Anonymous posting may be short-lived, though. I have experimented with it before, but I usually get huge amounts of spam after a few days (as if the spammers discover it at a certain point and then all give the URL to each other, hehe), so I'm forced to disable it if that happens. Comment moderation is no option for me, because I want the conversation to flow without me having to approve stuff (comments are really something that keeps me enthusiastic for this blog). We will see how long it holds out this time. Doesn't blogger have the ability to display a captcha for non-authenticated comments? That would help. Thanks for the suggestion, but many people really dislike CAPTCHA (among them, me) and I've heard several say that they just stop commenting on blogs where they have to fill in CAPTCHA all the time. I know it's a big barrier for me as well, being someone who likes to leave comments left and right. The easier and faster it is to leave a comment on a blog, the more inclined I feel to do so. Blogger could really use some updates in its comment section (there are more things that I feel are missing), but sadly I haven't seen any at all the past year. As it is now, it's either CAPTCHA for everyone, or it's a choice between allow Anonymous + accounts or accounts-only.